Around the Wherever: My week: May 17 ed. This was a fun week! It might be summed up as: learning German, traveling for work, celebrating men's day, hanging out with a sneaky Moo Doppelgänger, eating foraged salads and smoothies (and not dying, which is a mega bonus), the gaining of a new Moo fan without that person even meeting him, and seeing Nuremberg through the eyes of some locals. Oh yeah, and I also came to acquire Horst der Stinker. -I traveled for work early in the week. The air conditioning was not functioning in the work vehicle so we drove for two hours with the windows down. I ended up with a mega headache, probably a migraine. I have heard from many Germans that having the air conditioning on in a car gives them a headache, but I'm rather certain that having air pounding one's ears while flying down the highway at 80 mph isn't so healthful either. -After I rushed back to town, I stumbled through one German class. My headache was raging to the point that I could barely focus my eyes so I skipped class #2. -I traveled again for work later in the week and decided to make a mini vacation of the trip while I wasn't working. I took my own car so there was no problem with air conditioning. I stayed with three different hosts and had three very different, but fun experiences. The first family who hosted me live so far out in the country that their "village" is only about ten houses surrounded by farm fields. I arrived on the evening of a German holiday, which is both Ascension Day and Father's Day/Men's Day. The wife in the family told me that the men would be drunk when I arrived, but I was still welcome to stay. I was fine with that; it's not as if it's the first time I've been around drunk people and I've gone to other parties where I've only known a few people (and not even well) and had a good time. Men's Day involves men getting together, going on "hikes," pulling a wagon of beer, and drinking the beer. They might get together for a grillparty afterward. When I arrived, the men indeed were in the middle of a grill party. They cheerfully boasted about their five mile walk. I asked how long it took and laughed when they said it took five hours. It must have been a very slow walk, I said. They replied that they had to stop at a bar along the way and played some soccer games with kids. That would explain why their pants were covered in grass stains, which they proudly (and tipsily) displayed. They even won one of the matches; they were especially proud of that. It was an enjoyable evening; everyone welcomed me warmly and spoke English. They were incredulous when I said I could speak German too and kept switching back to English. That's fine; they were speaking the Franconian dialect and it is hard for me to understand it. One of the guys had studied in the US so we had a good chat about that. Soon, the Fraus returned from their own party and collected their men. I was trying not to crack up because it reminded me a bit of parents picking up their children from an eighth grade party. After we cleared up from the party, my hosts and I spent some time hanging out, chatting amicably. I also met their kitty, who looks quite a bit like Moo looks and is friendly too. He's a sneaky little bugger, for sure! The next morning, I stepped out of the room and when I came back, sat on the bed but heard a weird noise and bolted upright. Then something fuzzy touched me. It was the kitty's foot! 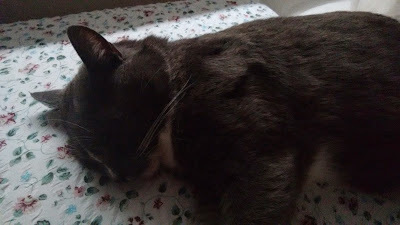 He sneaked in and laid on the bed. -The next evening, I stayed with a different host, out in the country side again, but not so far out this time. I have been interested in foraging wild plants to eat but have always been afraid to try on my own. L, the host, is incredibly well-versed in plants and alternative health so she shared her knowledge with me for a lovely evening. We "shopped" her garden for our dinner. At first glance it looks a bit overrun with weeds. After all, many of the plants are indeed what some would consider weeds: nettles, dandelions, and others. However, her collection yielded a very edible selection that made a delicious dinner salad, complete with dressing made from other weeds. L told me that if people knew how healthful dandelions are, they'd all be picked and eaten. The next morning, she made me a delicious green smoothie made again from plants from her garden and sent me on my way so I wouldn't be late for meeting the next host in Nuremberg. -I then met R and her friend E in Nuremberg as they were just finishing up breakfast, inviting me to join in. I was still full from the smoothie so I declined. E had brought an extra bike by for me to use. R and I took the bikes out to explore Nuremberg while E left for home to finish studying. I was a bit wobbly on the bike; it was too tall for me, but that just made things a bit more thrilling all around ;) R showed me around, taking me to a retro/second hand clothing store that she likes. I liked it too; I picked out a necklace and shirt, which is Moo-colored (gray) and will join my ever growing collection of Moo colored shirts and sweatshirts (a bit of an obsession, perhaps?). We then visited a section of town that was offering a Flohmarkt (flea market/yard sale) in the courtyards of building blocks. Apparently different sections of Nuremberg have them throughout the summer. One can find the sales by looking for a balloons hung outside the residences in the sections scheduled for the sales. E met us up with us again and we hung out for a while at Eisdiele, which is a cafe, ice cream parlor, and art forum. I really liked the vibe there. The ice cream was great, too! R and I rode our bikes to downtown Nuremberg. I picked up some postcards then we stopped at the youth hostel in the former castle stables to see if an employee I knew was working that night so we could say hi. My brother and I had met him in September when we stayed there and he was super nice. Unfortunately he wasn't working but I did leave a note from him. We biked back to R's apartment and she took me along the river. Whoa, it's amazing! There's a huge park that runs along it. People were grilling, playing games, and hanging out. R told me that there's a free festival under the bridge that's really good too. 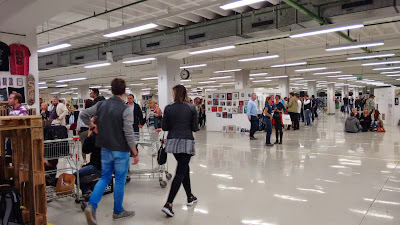 After relaxing at home for a bit, we ventured out again to the supermART art exhibition at the former Quelle building. Artists set up their works throughout the building as music played and people sipped beer and wine. It reminded me of some of the art events I attended in Detroit; it had a homespun, alternative feeling. I really enjoyed it. The next morning I was inspired by my earlier stay with L so I made a fruit/vegetable smoothie for R and it turned out well. We finished those up, I said goodbye, and drove home. I invited R to visit me and I talked up Moo so much that she's excited to meet him. He has a new fan club member already. We had gotten along famously and I hope to have her out to visit as soon as both of us have some free time. It was an awesome weekend. People were so generous, offering access to their lives and showing me a really good time. Life is good.